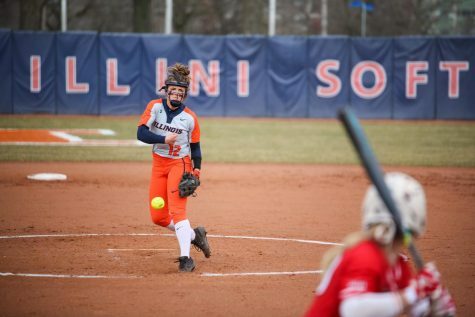 Illinois’ Breanna Wonderly delivers the pitch against Nebraska at Eichelberger Field on April 2 In this year’s I-75 Challenge, the senior started off the weekend pulling out a five-inning shutout against Georgia State. 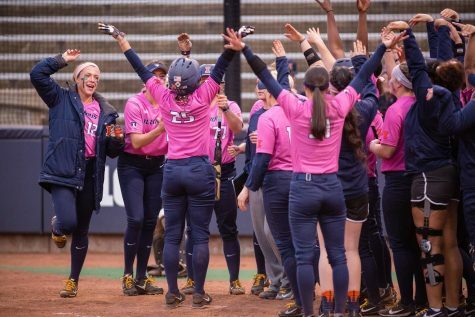 The Illinois softball team went 3-2 in the I-75 Challenge in Georgia this weekend. 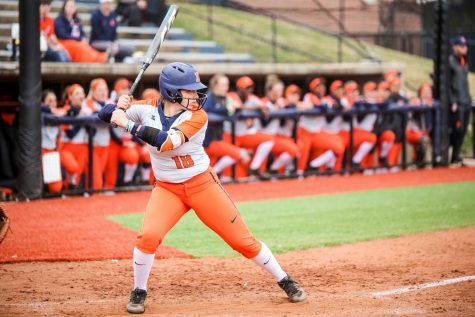 The Illini kicked off the weekend with a doubleheader against Georgia State on Friday. Senior pitcher Breanna Wonderly held Georgia to two hits and one walk while striking out one, leading to the five-inning shutout. 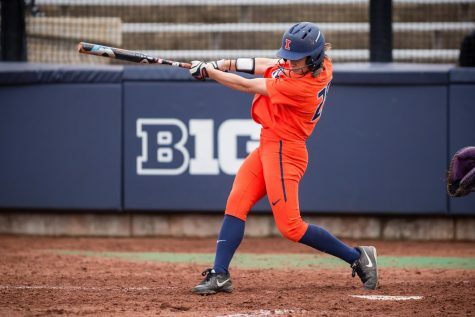 Though the Illini did not score in the first two innings, sophomore Kiana Sherlund drove in the first run in the third inning after a series of singles, followed by senior Nicole Evans hitting a three-run homer. Illinois scored two more in the fourth for a final score of 6-0. In Game Two, Georgia State snagged a 2-0 lead in the bottom of the first. Junior Leigh Farina hit an RBI single the next game, but the Panthers responded with a two-run double in the bottom of the frame. Sophomore Stephanie Abello then put the Illini within one with a two-run shot to left field in the third. The Panthers came back with four runs in the fourth, a run in the fifth and four more in the sixth, including a three-run homer that captured Georgia State’s 13-4 victory. 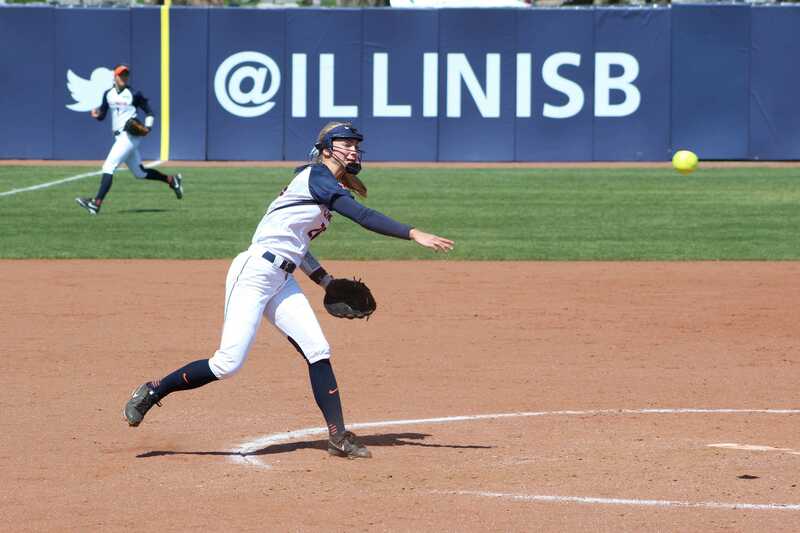 The Illini then played another doubleheader against Kennesaw State on Saturday. The Owls were the first to score with a two-out RBI single and a solo home run to lead off the second frame, making it 2-0. 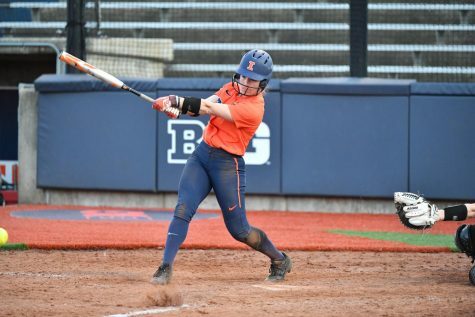 The Illini replied with four runs in the third as junior Annie Fleming slammed a three-run homer off the Kennesaw scoreboard in right field. Abello also added a solo shot later in the frame. Later in the inning, the Owls tied it up at four with a two-run homer. Neither team broke the tie in regulation, forcing an eighth inning that saw the Owls send a home run to right center for the 5-4 win. 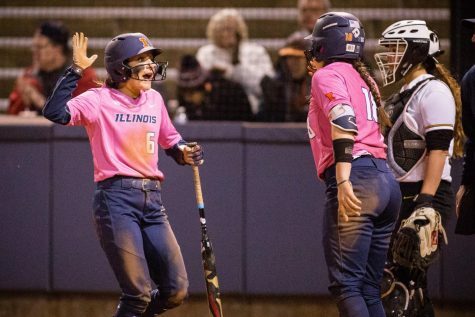 The Illini pounced on the Owls early in the next game when Fleming came home on an attempted steal by senior Alyssa Gunther in the first inning. Evans then knocked her first homer of the day for the early 2-0 lead. 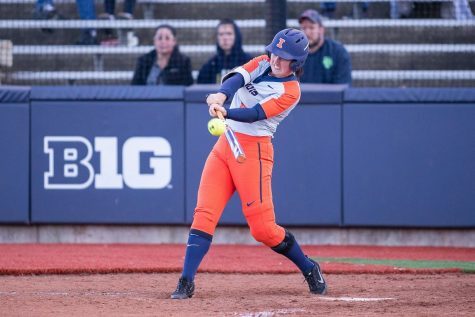 A six-run second inning pushed the Illini to an 8-0 lead, with Fleming’s two-run double to left center and another Evans lob – this time a two-run shot to left center – were the highlights of the inning. In the bottom of the second, Kennesaw State scored its only run of the game. 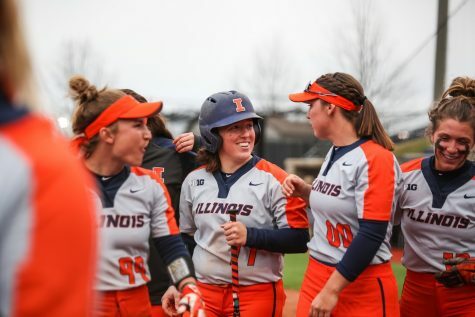 The Illini added two more runs in the third inning, but the team didn’t really shine until the fifth inning with nine runs to end the game, 19-1. In the final game played on Sunday, Illinois faced Georgia Tech. Evans once again got things started in the top of the first with another three-run homer. Georgia Tech responded with two in the bottom. No one scored again until the fourth inning, when Georgia Tech brought three more batters home, Illini down 5-3. By the end of the sixth, the score was tied at six. In the top of the seventh, the Illini broke the tie, adding four runs — Veronica Ruelius brought home two, and Sherlund brought in two more. With Georgia Tech not responding in the bottom, Illinois won, 10-6.